Despite the fact that LucasArts dissociated from the adventure genre some time ago now, it is never a bad time to acknowledge the role of the company in the history of videogames; so much so that even decades later its games still feel fresh in the collective memory of every single adventure gamer. There were a lot of classics that the company had in its catalogue back then, and most of them are nowadays in the Hall of Fame of adventure games, a well deserved place. It is a must to revive them with all due nostalgia, especially today that the break-up of LucasArts with adventure games is more than a fact, but… what if we told you that all those masterpieces could have been more, had some unfinished adventures finally made it up? With this article we are trying to appeal to that masochistic perversion many adventure gamers suffer from, and so we will tell you what would those projects brewing in the Skywalker Ranch have been, focusing this time in the case of those based on the franchise that George Lucas and Steven Spielberg created more than 25 years ago: Indiana Jones . Indy is back. And his return after nearly two decades has not been a bed of roses. Some of the scripts which were discarded at LucasFilm ended up in the hands of LucasArts’ designers. And, as this article states, they were the final responsibles of the scripts ending in the trash. The question now is: What would they have done with David Koepp’s one? Indiana Jones . These words probably recall a lot of emotions and memories for many of you. Indiana Jones has now become a popular icon all around the world, even more now that the Hollywood machinery has brought the hero back with the recent release of the widely expected fourth film in the franchise, after years of its “last crusade”. The series is without a doubt among the movie experiences that have marked the most an entire generation; a generation, on the other hand, especially predisposed to get marked by a bunch of filmmakers particularly inspired at the time. Years have passed but the strength of the famous archaeologist remains intact (not the case of his real counterpart, Harrison Ford): the franchise still has potential for lots of entries in popular rumorology, and there are tons of fans of Spielberg’s creation. Fans that have taken the original stories as a referential base to write their own cinematographic scripts, to develop their own games, to write their own books… fans who buy everything related to Dr. Jones and who have favoured with their dedication (and their monetary contribution, of course) the creation of lots of merchandising: from articulated action figures for which small fortunes are paid, to videogames. Loyal fans of Henry Jones Junior have not had much luck in this field, as, apart from a few exceptions, games related to Indiana Jones did not quite meet the expectations they had. To honour the genre we love, perhaps the most acclaimed videogame adaptations of Indy’s adventures were the two adventure games published by LucasArts. Indiana Jones and the Last Crusade is today nostalgically idolized while Fate of Atlantis , its so-called “sequel”, is widely recognized as a masterpiece and was even rumoured to be the hypothetical script of the fourth part now become a blockbuster. One of the more ancestral traditional chinese legends was mixed with the Fountain of Youth myth to make born Indiana Jones and the Garden of Life , an idea written by Chris Columbus in the eighties which ended up in the hands of Noah Falstein and Hal Barwood even before they planned Fate of Atlantis . When we saw those games in the stores no one could then imagine they would not have more sequels, at least as pure adventure games. There was some controversy when fans of the whip and Fedora hat realised they had been waiting in vain, but the truth is that behind those hermetic doors of Skywalker Ranch several attempts were made to get Indiana back to the hands of adventure gamers. This franchise must not be an easy one to adapt, having into account the results it has had in the videogame history: two big successes and two big failures. 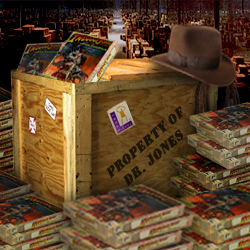 It seems that, as though the license was the victim of a curse, Indiana Jones had a hard time to get back to video gaming, even before the brewing of the renowned Fate of Atlantis : after the overwhelming success of the adventure version of The Last Crusade , within LucasFilm Games, the idea of a new game in the series began to forge. For that matter they initially wanted to take as a plot base a movie script written by nothing less than Chris Columbus; a rejected script originally addressed to become a part of the movie series as a culmination of the trilogy. In that script, Indiana Jones was set in pursuit for the fruit of Eternal Youth from the garden of a monkey-God by the name of Sun Wu-Kung. Obviously, Dr. Jones’ path towards it would not be a bed of roses, and struggling with him in the search of such relic would be the entire army of the Third Reich. The story would then follow a course increasingly unlikely, to eventually end with the death of Indy himself and his resurrection by the monkey-God. Indiana Jones and the Garden of Life , that was the title given, ended up exactly where it was found: in a paper bin. Apparently, Hal Barwood and Noah Falstein, who were in charge of the “new Indy game”, did not see in that enough potential for a game. Falstein himself comments on this experience: “Hal Barwood and I had done some work on an Indiana Jones concept based on the original script for the 3rd movie, a script that was rejected by George and Steven in favour of the Last Crusade one. We read through the script – it was obvious why they had decided not to make it into a movie”.